Tue-Fri 10 a.m. – 6 p.m. Sat 11 a.m. – 8 p.m. Commissioned by Thyssen-Bornemisza Art Contemporary. 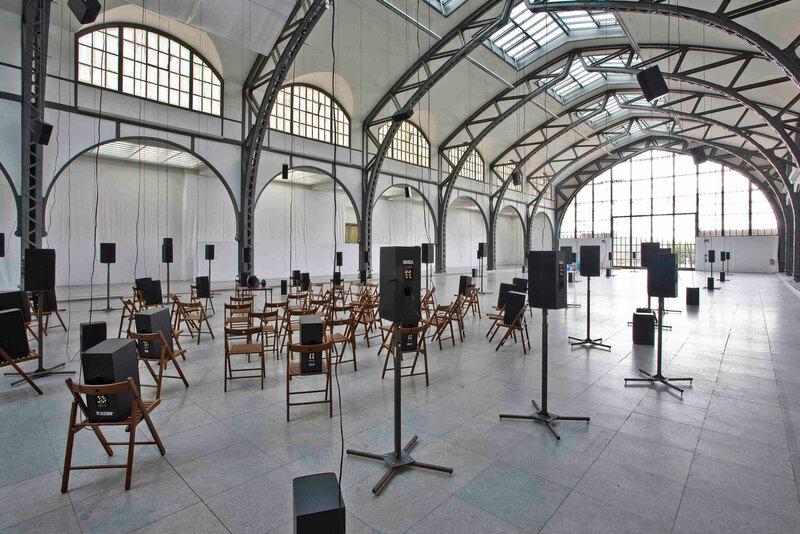 With »The Murder of Crows«, their largest sound installation to date, the Canadian visual artists Janet Cardiff and George Bures Miller continue the explorations they embarked on in the mid-1990s into the sculptural and physical attributes of sound. 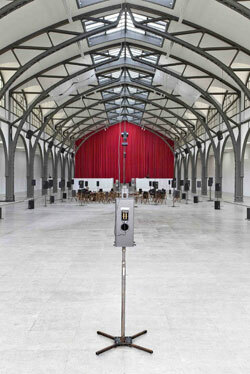 In the otherwise empty historical hall of the Hamburger Bahnhof, 98 loudspeakers are installed. These emit the sounds of voices, music and soundscapes generated by special stereophonic recording and replay techniques, creating a composition that has a direct physical impact on the listener. 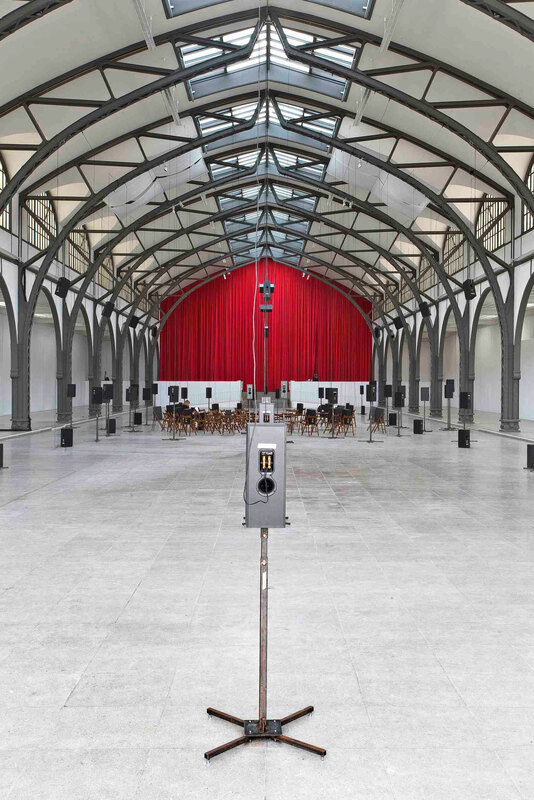 The special Ambisonic soundfield system generates a greatly intensified aural and emotional space, so that the acoustic events that transpire in the three-dimensional soundspace have a startling, disconcerting immediacy. The installation is conceived like a film or a play, but one whose images and narrative structures are created by sound alone. The three-part work, composed in collaboration with Freida Abtan, Tilman Ritter and Titus Maderlechner, is 30 minutes long. The installation’s title, »The Murder of Crows«, refers both to the English term for a flock of those birds and to the strange occurrence known as a ‘crow funeral’: when a crow dies, many other crows converge around the body and caw, perhaps in lament, for over 24 hours. Another central reference is the etching »The Sleep of Reason Produces Monsters« by Francisco de Goya from the series »The Caprices« (Los Caprichos, 1799). In this suite of etchings, Goya, in the spirit of the enlightenment, took a critical look at tyranny, ignorance and superstition. In an epoch characterized by political and social upheavals, wars and insurrections, he warned: »Imagination abandoned by reason produces impossible monsters«. His etching depicts a man asleep at a table, head resting on his crossed arms, encircled by a threatening swarm of night creatures. Is he the master of the demons his dreaming imagination conjures up, or do they have mastery over him? Are the birds of horror flying at him or does he incite them to flight? It’s an open question. In the installation by Cardiff & Miller, one hears Janet Cardiff’s voice, coming from a megaphone lying on a table at the center of the room, relating thoughts and dreams. Like Goya’s sleeping man, she is a captive of her own nightmares, experiencing dreadful scenes fraught with fear and terror. Sounds and noises roam the space of the exhibition like the owls and bats that flit around the sleeper in Goya’s etching. In the transition from one sound world to the next, the work’s structure follows the illogical yet somehow interrelated progressions that we know from the realm of dreams. The sound piece becomes a requiem for a world that has lost its bearings, where a dearth of reason – but also an excess of expedient rationality – has brought forth unimaginable atrocities, madness, and catastrophe. For this installation, the two artists again employ technical processes they developed for earlier works such as »The Forty Part Motet« (2001), »The Berlin Files« (2003) and »Pandemonium« (2005), now expanding those field-tested control systems through the use of newly created software. Their spatial dramatization of the acoustic material goes far beyond the scope of the classic radio play, as they carry the listener off into a fascinating, uncanny world full of suggestive sounds and dream images. Janet Cardiff, born 1957, and George Bures Miller, born 1960, live and work in Berlin and Grindrod, British Columbia, Canada. Together they work at the border zone of visual art, audio art, film and theater. In their installations, they explore the affective impact of sound and its influence on our perception and experience. And so the listener, the exhibition visitor, effectively becomes a protagonist in their audio-visual stagings, as with the sound and video walks they have created for numerous exhibitions around the world since 1995. »The Murder of Crows« exhibition is one in the series of »Works of Music by Visual Artists« which has been presented since 1999 by Freunde Guter Musik Berlin e.V. in collaboration with the Nationalgalerie, and since 2002 with MaerzMusik – Festival of Contemporary Music | Berliner Festspiele. The work was commissioned by Thyssen-Bornemisza Art Contemporary, Vienna for the Biennale of Sydney 2008, where it was first realized. Nationalgalerie im Hamburger Bahnhof, Museum für Gegenwart – Berlin and Thyssen-Bornemisza Art Contemporary, Vienna. In collaboration with MaerzMusik 2009 | Berliner Festspiele. Made possible by funding from Hauptstadtkulturfonds and Canada Council for the Arts. 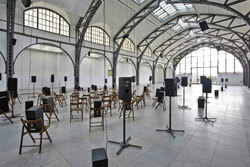 With support from Bowers & Wilkins Speakers and Canadian Embassy, Berlin. With thanks to Biennale of Sydney 2008, Galerie Barbara Weiss, Berlin, and Luhring Augustine, New York.